Super Smash Bros. for Wii U is the fifth installment of the Super Smash Bros. series, and was developed by Sora Ltd. and Bandai Namco Games. While this game and Super Smash Bros. for Nintendo 3DS were developed simultaneously, the Nintendo 3DS version launched earlier due to its earlier completion of development. Like with most other Nintendo 3DS and Wii U software titles, this title can be purchased at retail stores or from the Nintendo eShop, with the digital version requiring 15,700 MB (approx. 15.3 GB) of memory to be installed. Due to the amount of space that it requires, standard set Wii U consoles are not able to download this title without an external storage device, but deluxe set Wii U consoles can. A follow-up title for the Nintendo Switch, Super Smash Bros. Ultimate, was released four years after Super Smash Bros. for Wii U in 2018. Super Smash Bros. for Nintendo 3DS and Super Smash Bros. for Wii U have some similarities and differences from Super Smash Bros. Brawl, as well as differences between the two versions. Final Smashes and Footstool Jumping make a return, while the "tripping" mechanic has been removed. The pace of battles has also been stated to be in between Super Smash Bros. Melee and Super Smash Bros. Brawl. Both games have the same roster of playable characters in order to keep them consistent. The movesets and animations of some returning characters were changed more significantly than during the transition from Super Smash Bros. Melee to Super Smash Bros. Brawl, with many returning characters having completely new moves, and major alterations (such as Pit). Aesthetically, the games are much more stylized and visually intense than previous entries, with the overall colors being bolder and brighter and many elements having been redone to stand out more, and the characters also appear more similar to their current appearances from their franchises of origin, lacking realistic details in them. The Wii U version does not make much use of the GamePad's touch screen during gameplay. However, in addition to Off-TV Play, the Wii U GamePad can display in-battle stats, such as damage percentages. Like in all games, Smash has its traditional fighting game mode with its customized rules where four chosen fighters play on chosen stages. This includes the Stamina mode (where players get HP that decreases), Time (time limit), Stock (lives) and Coin Battle (winner is the one that collects the most coins). Special Smash also returns in this version, allowing players to battle under certain conditions. Players can send customized fighters from one version to the other. Players can customize fighter's special attacks with one of three variations for each. The Mii Fighters and Palutena, however, have custom special attacks that aren't variants of the original attacks; these are unlocked from the beginning. Players can also equip items to fighters to increase specific attributes (attack, defense, or speed) while sacrificing others. Up to three items can be equipped at a time, and some items provide additional side effects to the fighter. Custom characters cannot be used in With Anyone online. Additionally, by connecting the two games the player can use their Nintendo 3DS as a controller for the Wii U version; alternatively, players can download the "Smash Controller" application off the Nintendo 3DS eShop to use their system as a controller. A new game mode known as 8-Player Smash is also available. As opposed to the traditional four player battles Super Smash Bros. is known for, up to eight players can join a single battle. An option of four teams is allowed, with the yellow team serving as a new team color choice. In this special game mode, most stages are restricted when five or six players are playing and even more when seven or eight are playing; in stages that are playable in 8-Player Smash, stage hazards such as bosses and other features are removed for optimization purposes, though stage incompatibility has shown to be mostly arbitrary, with even some incompatible stages featuring 8-Player spawn points. Omega variants of the same stage may allow for more players. Players additionally cannot play coin battles in 8-Player Smash. Smash Tour is a new mode serving as the exclusive mode for the Wii U version. Smash Tour is a board game mode in which players (as Miis) travel around a board by spinning a wheel, collecting fighters and power-ups for their fighters scattered around the board. Players start with two fighters by default. If two players cross paths, then all players are pitted into a Smash battle for a reward, and the winner obtains a fighter from one of the other players. Players may also obtain items that can be used to trigger various effects, and random events may also occur on the board. Checkpoints are also scattered around the board which boost players' stats when they pass over them. After all the turns have ended, players fight in a Stock match using their stat boosts, their stock based on the fighters they collected. The player can choose between a small, normal-sized, and big board to play on. In Special Orders, the player has the choice of playing either "Master Orders" or "Crazy Orders", referring to Master Hand and Crazy Hand. In their respective modes, Master Hand and Crazy Hand construct challenges for the player. Players purchase tickets in order to face challenges. In Master Orders, players purchase tickets in order to try one of three challenges, the reward depending on the difficulty; each ticket is used separately, and each challenge may only be tried once. Playing Crazy Orders requires the player to either use a pass or pay 5,000 gold; the player can then play any number of challenges to rack up rewards within a set time limit before facing Crazy Hand in a final battle. If the player loses at any point they lose some of their rewards. Events return from the previous two installments, in which players take on a series of themed battles. Events are arranged in a grid, however, and the path forward reveals itself when the player completes a given event. Players can also receive various rewards such as trophies, gold, and Special Orders passes by completing challenges. Like in Super Smash Bros. Brawl, two player Events are also available. Masterpieces from Super Smash Bros. Brawl returns as a feature in the Vault. It offers many short demos of past Nintendo games that can be played for a certain amount of time. The game can redirect the player to the Nintendo eShop where they may purchase the Virtual Console version of the game, if it is available on the service. The Wii U version's Classic Mode operates in a different manner from that of the 3DS version. It still maintains the intensity system in the 3DS version; players can spend gold to increase the intensity level, and if the player gets a Game Over, some of his/her rewards will be lost, and the intensity will lower by .5, unless the intensity level is set at 2.0. Instead of paths, the player has to choose which group of fighters that he/she wants to fight. As many as seven opponents may be fought in a single stage. One of the opponents includes the rival, which is programmed to be harder than the other opponents. The longer the rival stays alive, the stronger it'll become. On some occasions, an intruder may pop up for one match; the intruder will either be giant-sized or metallic. Some opponents may even possess rewards, which can either be gold, trophies, custom parts, or a Crazy Orders Pass. When the player KOs any opponents, their trophies will be displayed in the "Fighters Defeated" box. The defeated opponents can later be used as allies for any team battle matches. In team battles, opponents that the player's allies KO will also be added to the "Fighters Defeated" box. There are a total of seven stages, with the first three stages consisting of battles against default opponents and the rival. For stages 4 and 5, the player will face an additional group of opponents, but they'll use their alternate color schemes; these opponents may also come equipped with their custom special moves. Stage 6 pits the player against the Fighting Mii Team, where they must KO twenty Fighting Miis. Stage 7 pits the player against Master Hand, but higher intensities will add Crazy Hand, and even Master Core to the mix. Unlike in the 3DS version, the player does not have the option to avoid fighting Crazy Hand on intensity levels 3.0 and higher. Unlike Classic, All-Star is almost the same as in the Nintendo 3DS version. Some differences include a larger rest area, and the characters appear in reverse chronological order; at the beginning, players face the newest characters, and finish with the oldest fighters in the game. * - Only available in the full All-Star mode. ** - Downloadable content. Only available in this mode after downloading, but it will be removed if the player deletes the game's DLC data. Inclusion does not affect any of the game's challenges. Just like in the Nintendo 3DS version, three stadium games are playable. Home-Run Contest follows the same rules as in the previous installment but with an option to compete with four players. Target Blast now has three stages to play with instead of one, up to four players can participate, and the bomb is bigger in the second round, resulting a bigger explosion when that happens. Multi-Man Smash remains the same as in the Nintendo 3DS version. Similar to the Nintendo 3DS version, the Vault allows players to view and buy Trophies and view records, tips, and replays as well as listen to the sound effects and music. In this version, however, players can also view the games' promotional trailers, ending movies for the fighters, as well as play Masterpieces. There are a total of 743 trophies in the Wii U version. In the Trophies menu, players have the option to buy Trophies from the Trophy Shop like in the Nintendo 3DS version. Trophy Rush is also available, though in this version up to two players can play. Like in Super Smash Bros. Brawl, Photo Studio allows the player to pose and resize their Trophies on various backgrounds and take pictures of them. Another new mode known as Trophy Box allows the player to fill boxes with trophies based on a given criteria, such as game series (Paper Mario, New Super Mario Bros.) or specific games (Super Mario Galaxy, Super Mario Galaxy 2). This game features online play similar to Super Smash Bros. Brawl in that players from all over the world can face others in matches. When playing With Friends, players can customize the rules to their liking. Voice chat is also available when playing With Friends, though like Mario Kart 8 it can only be used between battles. When playing With Anyone, two basic options are available: For Fun and For Glory. In For Fun mode, players battle on randomly-selected normal stages, excluding Final Destination, with all items turned on. Losses are not recorded in this mode. In For Glory mode, players only play on the flat, Final Destination versions of stages, without items. Players can either play standard Smash or Team Smash matches in both modes, and For Glory offers a 1-on-1 mode as well. Conquest pits some of the game's various characters against each other, and players who win battles with them in With Anyone mode will add points to that character's score. After a few days, the winning fighter is revealed, players who took part in the conquest by playing as that character get rewarded with gold, and the next conquest begins. The full character select screen, including all downloadable characters. Including DLC characters, this installment features a total of 58 playable characters. These consist of 37 veterans and 21 newcomers. Certain characters from previous Super Smash Bros. games have been removed from the rosters of both the Nintendo 3DS and Wii U versions in order to keep them consistent, partly due to limitations with the Nintendo 3DS version. Unlike previous games in the series, with the removal of in-game transformations, Sheik, Zero Suit Samus, and Charizard are now standalone characters. Of the roster, eleven characters are from the Mario universe (eighteen if the seven Koopaling alternates for Bowser Jr. are counted): Mario, Luigi, Peach, Bowser, Yoshi, Rosalina, Bowser Jr., Wario, Donkey Kong, Diddy Kong, and Dr. Mario. Mewtwo returns from Super Smash Bros. Melee as a downloadable, 50th character, releasing for free to Club Nintendo members who signed up for a promotion involving the purchase of both the Nintendo 3DS and Wii U versions of the game. It was released as a paid download later on for those who did not register both versions. In addition, two more characters return from previous installments as downloadable characters, namely Roy from Super Smash Bros. Melee and Lucas from Super Smash Bros. Brawl. Four more newcomers made their debut as playable characters: Ryu from the Street Fighter series, Cloud Strife from Final Fantasy VII, Corrin from Fire Emblem Fates, and Bayonetta from the Bayonetta series. DLC characters do not have any custom special moves. Super Smash Bros. for Wii U has a total of 55 stages, mostly based on home console games to differ from Super Smash Bros. for Nintendo 3DS's stages, which are mostly based on handheld games. 34 of the stages are new with 21 returning from the previous three games. 41 of the stages are immediately available with five being locked and nine being downloadable. Thirteen stages are shared between both versions, which includes all downloadable stages aside from Pirate Ship and Miiverse. Unlike Super Smash Bros. for Nintendo 3DS, this game has a full My Music feature, allowing players to change the frequency at which each song plays for every stage. Players can change the music settings in the My Music menu, or on the stage select screen by pressing . Finally, every stage in the game has an "omega" ("Ω") variant, a completely flat stage similar to Final Destination, which can be selected on the stage select screen by pressing . Stages listed in italics are unlockable. The general layout of this stage has not changed since the original Super Smash Bros. It has a long base platform with three semi-solid platforms hanging above it. In this game, ruins surround the Battlefield and the time of day rotates as battles continue. This is one of the few stages shared between versions. Like in previous installments, Final Destination is a simple stage, consisting only of a large platform with no stage hazards or other gimmicks. When playing through Classic Mode, the bosses Master Hand, Crazy Hand, and/or Master Core are fought here. The scenery changes as battles continue. This is one of the few stages shared between versions. Mushroom Kingdom U changes between areas based on New Super Mario Bros. U, each with its own properties and hazards. Additionally, the character Nabbit occasionally appears to trap players in his bag and carry them off-screen. Taking place on the Gateway Galaxy planet from Super Mario Galaxy, this stage has a large planet with a curved gravity which affects the characters and most projectiles. Two semi-solid platforms also hang above the stage. Returning from Super Smash Bros. Brawl, the stage has players battle in Delfino Plaza from Super Mario Sunshine. The main stage itself is a large platform with several semi-solid platforms above it, the layout of which changes each time the stage returns to pick up player after dropping them at a location in Delfino Plaza. Players can fight in locations ranging from Bianco Square to on top of the Shine Gate. This stage is based on the Mario Circuit from Mario Kart 8. The main stage carries players around the race track and drops them at certain points, much like Delfino Plaza. Several Shy Guys are seen racing around the track and can damage the players if they come into contact with them. This stage returns from Super Smash Bros. Brawl. Despite being called "Mario Circuit", it does not appear to be based on any Mario Circuit in particular, instead more closely resembling the Figure-8 Circuit track from Mario Kart DS. It consists of three semi-solid platform placed above the ground, all of which Shy Guys drive on, damaging players if the Shy Guys run into them. If battling with more the four players, the Shy Guys are absent. Returning from Super Smash Bros. Brawl, this stage is based on the mansion of the same name. There are three levels to the stage which players can jump between, though the mansion itself is situated over a large chasm. The pillars holding the mansion up can be destroyed, collapsing the mansion upon doing so. However, the pillars cannot be destroyed when battling with more than four characters. A stage based on the level of the same name from Donkey Kong Country Returns. Unique to this stage are dual planes, a feature taken from Donkey Kong Country Returns; there's a battlefield in the front and one in the back. Both have several platforms the players can jump between and the Barrel Cannons are the means of transport between the two planes. Returning from the first Super Smash Bros., this stage has a base platform with two semi-solid platforms above it and a rotating set of platforms in the center. A single, rotating Barrel Cannon travels beneath the stage, launching anyone within it. This stage has players fighting on a large platform containing several semi-solid platforms above it as the stage travels around Skyloft from The Legend of Zelda: Skyward Sword. The stage drops players off at various locations on Skyloft for players to continue fighting on, ranging from underneath the floating island to the top of the Statue of the Goddess. Returning from Super Smash Bros. Brawl, the stage is based on the Bridge of Eldin from The Legend of Zelda: Twilight Princess. It is a long, stone platform. Occasionally, the character King Bulblin will ride across the stage and drop a bomb, destroying the center part of the bridge. Later on, a Portal will appear to repair the bridge. Returning from Super Smash Bros. Melee, this stage is based on the temples found in The Legend of Zelda series. It is a large stage with several platforms and an underground area, all suspended in midair. Based on the Pyrosphere from Metroid: Other M, specifically the Geothermal Power Plant. The stage consists of a large base platform with semi-solid platforms hanging on either side. Like in Metroid: Other M, Ridley can be fought here, though he'll join a player's side if he is attacked by that player enough times. Other enemies from the game also appear. Returning from Super Smash Bros. Brawl, this stage is based on the location of the same name from the Metroid series. The stage has several platforms situated over a large pool of lava. The lava will occasionally rise up, encompassing most of the stage, along with large geysers and walls of lava coming from behind and the sides of the stage. When battling with more than four players, the lava geysers and walls will not appear. Returning from Super Smash Bros. Brawl, this stage is based on the Port Town - Aero Dive from F-Zero GX. It has the player fight on a long platform that goes around the track, occasionally lowering the players onto the track itself. Several F-Zero racers race along the track and will damage the player if they come into contact. A stage based on the aesthetics of Yoshi's Woolly World. The stage has a large mobile with hanging platforms that will rise into the air after enough time has passed. A stage based on the elements from Super Mario World and returns from Super Smash Bros. Melee. It has several Rotating Blocks acting as platforms, a hill to the right, and a sloped Warp Pipe to the left. Based on the Great Cave Offensive from Kirby Super Star, the stage is a giant labyrinth filled with platforms, Danger Zones, and randomly generated treasure chests. It is the largest stage in the game. A stage returning from Super Smash Bros. Brawl. The main platform circles around Meta Knight's Halberd ship. The platform will eventually rest at an opening on the ship where the players will become vulnerable to the ship's large cannon. A stage based on the Orbital Gate from the Star Fox series, specifically during the Aparoid invasion from Star Fox Assault. The platform layout constantly changes as the ships and the Aparoid missiles move around. If Fox and Falco aren't present during a match, a conversation between the Star Fox crew can be activated. A returning stage from Super Smash Bros. Brawl. The layout of the stage is similar to Battlefield's, though the platforms are more angled. As the ship goes through the stage's scenery, the stage will tilt slightly, making certain moves difficult to connect. This stage is based on the Kalos Region's variant of the Pokémon League from Pokémon X and Pokémon Y. The stage cycles between the main hall and the four other chambers, representing a member of the Pokémon League and the appearance and gimmicks of the stage change accordingly. A returning stage from Super Smash Bros. Brawl. The stage's layout constantly changes, and the hazards change depending on the current "type" variation the stage is on. Returning from Super Smash Bros. Melee, this stage has several buildings the player can jump between, including two houses and a drug store. Occasionally, cars will drive by close enough to the stage to damage players if they're on the ground. Additionally, the rafters on the drug store will collapse if player jump on it too many times. A stage based on the several arenas from the Fire Emblem series. At first, the stage is long and flat, though platforms will continuously rise and fall as the battle continues. A returning stage from Super Smash Bros. Brawl. The stage cycles between three phases: a castle's exterior, the castle's interior, and a lava-filled underground area. All of which are common areas seen in the Fire Emblem games. A combination of the Flat Zone stage from Super Smash Bros. Melee and the Flat Zone 2 stage from Super Smash Bros. Brawl and Super Smash Bros. for Nintendo 3DS. As such, it features elements from both of those stages. A large stage based on Palutena's Temple from Kid Icarus: Uprising. It features many platforms and hazards, some of which can be destroyed or will move. Pit, if present on the stage, is also able to communicate with Palutena and Viridi to get advice on his opponents. A returning stage from Super Smash Bros. Brawl. The platforms present on the stage can be temporarily broken, allowing players to fall through them. A stage based on the game of the same name that can be played in Game & Wario. The stages layout changes each time it's played on, but it always takes place on a large table. 5-Volt constantly appears and any characters caught in her gaze will be launched. Players can use the layout to hide from her when she is present, however. A stage based on Garden of Hope from Pikmin 3. As well as featuring many platforms, a Peckish Aristocrab will occasionally appear to destroy the structures and heavily damage players it comes into contact with. A stage based on both the player's town and the city from Animal Crossing: City Folk. It moves between two locations, with the characters and background changing respectively. The stage itself is one solid platform with several semi-solid platforms above it. The time of day is affected by the Wii U system's built-in clock. A returning stage from Super Smash Bros. Brawl. It is similar to Town and City in design, but does not feature the city background (as this stage is based on Animal Crossing: Wild World, which did not feature the city). The time of day, like Town and City, is affected by the Wii U system's built-in clock. A stage based on the Wii Fit series. The stage features a mirror that will change occasionally to a silhouette demonstrating yoga poses and platforms designed after Wii Balance Boards. A stage based on the Boxing Ring of the Punch-Out!! series. The ropes around the ring of the stage act as springs and can be used to get to the stage's light fixture, which can be knocked down and damage opponents. Based on the Gaur Plain from Xenoblade Chronicles, the stage consists of a multitude of platforms. Metal Face attacks fighters at night and can destroy the platforms. This is one of the stages shared between versions, though the 3DS's variant is smaller and lacks Metal Face. A stage based on the game Duck Hunt. The stage is one long platform with the trees acting as platforms above it. The Duck Hunt dog will pop out of the grass occasionally, acting as another platform himself. Initially available only for the Wii U version, it was included in a free update for the 3DS version on September 30, 2015. Returning from from Super Smash Bros. Brawl, this stage is based on the 75m level from the original Donkey Kong game. It features many ladders, platforms, and obstacles. The retro Donkey Kong found here will even occasionally send springs from the left side to act as obstacles. This stage stays true to its origin of the NES game, Wrecking Crew, though with a big overhaul in design. The bombs will cause the above floor to fall when attacked and the barrels can trap characters temporarily if they fall on them. A stage based on two areas from the Pilotwings series. As it travels between locations, characters battle on planes. The match starts on the classic red bi-plane from the original Pilotwings before shifting onto the modern yellow bi-plane from Pilotwings Resort. A stage taking place on Wuhu Island; a location which first appeared in Wii Sports Resort. Its main platforms bring players around the stage, dropping them at several locations for the fight to continue on. A medium-sized stage, based on the first area from the Lost Hex, found in Sonic Lost World. It features many different types of platforms, including a large wheel with rotating platforms. Like with the Mario Galaxy stage, the main platform is curved, affecting players' and some projectiles' gravity. A stage based on Wily Castle from the Mega Man series, with this iteration specifically based on Mega Man 2. Several platforms move around the stage. The Yellow Devil appears occasionally and interfere with the battle. A stage based on the game PAC-LAND. It is a scrolling stage, moving between locations from said game. A stage returning from Super Smash Bros. It is based on the Dream Land stages of the Kirby series. Its layout is exactly like Battlefield's: A base platform with three platforms above it. Whispy Woods will occasionally blow wind to push characters toward the edges of the stage. Bronto Burts and King Dedede appear in the background of the stage. A stage based on Ryu's home stage in Street Fighter II. The stage has four wooden platforms; the two to the right have walkoffs, while the left side has one small platform above another small platform. There are signs that can be broken, but they do not have any influence on gameplay. A stage available as free DLC from the 1.0.8 update. It is based on Miiverse (Nintendo's social website service) and posts from players can be displayed in the stage's background. The layout is exactly like Battlefield's. This stage cannot be played online. A stage returning from Super Smash Bros. This stage has a tower with a moving board and a thin, pass-through platform as well as two slanted platforms hovering in mid-air. A bumper is situated above the stage which will knock away players that hit it. A stage returning from Super Smash Bros. This stage plays out on the top of Hyrule Castle from The Legend of Zelda: Ocarina of Time. Aside from the base platform, it has a slanted area to the left, floating platforms in the middle, and a covered area to the right. Every 30 seconds, a whirlwind appears, able to catch players and fire them up into the air, which can KO them at high percentages. A stage based on Super Mario Maker. The layout of the stage is different every time it is played on, containing several platforms ? Blocks, and Brick Blocks. It also has elements the original game doesn't, such as placable lava and slopes. The style of the stage changes throughout the battle, changing through the styles of Super Mario Bros., Super Mario Bros. 3, Super Mario World, and New Super Mario Bros. U. A returning stage from Super Smash Bros. Brawl based on Tetra's Pirate Ship from The Legend of Zelda: The Wind Waker. The deck of the ship acts as the main platform with the mast containing two more platforms above it. A catapult also comes out of the ship and will launch players standing on or near it. The King of Red Lions will sometimes sail up to the stern of the ship acting as another platform. Midgar is the city from Final Fantasy VII. The stage has a similar layout to Battlefield, but during the battle, collecting a Summon Materia causes one of the game's summons to appear and attack the stage and combatants. A piece of the falling clock tower from the opening of Bayonetta. While the stage itself is completely flat, pieces of debris may fly by to serve as platforms. Super Smash Bros. for Nintendo 3DS and Super Smash Bros. for Wii U feature many new items. Both versions feature the same types of items. 75 items, 26 of which are new, appear in the games. Just like the Assist Trophies, Nintendo has implemented the use of Pokémon. This set of Pokémon features more focus on the fifth and sixth generations, but still features Pokémon from previous generations. The Wii U and 3DS versions have the same amount of Pokemon. 40 different species are featured, of which 23 are new. Super Smash Bros. for Wii U has received critical acclaim, praising its variety of modes and character selection. Griffin McElroy, Polygon 9.5/10 "Pound for pound, Super Smash Bros. for Wii U has been the most fun I've had playing video games in 2014, and a well-polished crown jewel in the Wii U's library. I've spent dozens of hours Smashing roomfuls of friends into oblivion, grinding through events and hunting down unlockables — and, happily, I feel like I'm just getting started." Daniel Starkey, GameSpot 9/10 "Poor internet functionality is, thankfully, a blight on an otherwise incredible game. Between the Masterpiece Collections, which are short demos of the classic games that inspired Smash Bros., the many fighters and stages, the deep character customization for fine-tuning your fighters to suit your play style, and the extensive screenshot editing tools, there’s just so much to do. With the Wii U release, Smash Bros. has fully realized its goals. There’s something here for nearly everyone--from young to old, from novice to expert--presented almost without compromise. Super Smash Bros. Wii U invites everyone to join in its undiluted, joyous celebration of the broad community that Nintendo has built over the past forty years." Jose Otero, IGN 9.8/10 "Nearly every aspect of Smash Wii U seems fine-tuned not only to appeal to the nostalgia of long-time Nintendo fans, but also to be accessible to new players. Once they’re hooked, it draws them in deeper with a set of great modes and tempting rewards. There’s just so much here, and I’ve rarely seen a game with so many enjoyable and replayable ideas in a single package. Playing eight-player matches and classic four-player brawls are only the beginning, and I don’t see a reason to stop playing Super Smash Bros. for Wii U for a long time." Within three days of launch in North America, Super Smash Bros. for Wii U sold over 490,000 units, making it the fastest-selling Wii U title in North America. 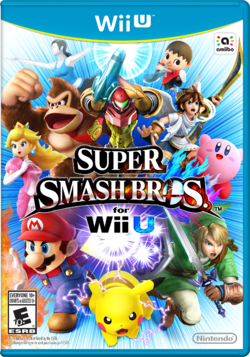 Super Smash Bros. for Wii U also won the award for the "Best Fighting Game" at The Game Awards 2014. Note that the most recently released software update must be downloaded in order to access Online. In addition, most updates invalidate replay data created before that update, making them unplayable, due to replays reading game data and inputting recordings of data live, rather than actual footage. On the same day as the release of the game, update version 1.0.1 was released for Super Smash Bros. for Wii U. The update makes fixes to enhance gameplay stability. For those who pre-ordered the game digitally, the update is part of the game download. The second update was released January 29, 2015, the update's download size is 316 MB, and it updates the game to version 1.0.2. It is also required for online play. The update adds 15 additional stages to 8-Player Smash mode, nine standard and six omega forms, in addition to making other minor fixes. Super Smash Bros. for Wii U's players of these countries (in blue) can send and receive photos, replays, custom stages and Mii characters via online. The third update for Super Smash Bros. for Wii U was released the same day as the Mewtwo downloadable content for Club Nintendo members as well as the additional Mii suits, updating the game directly to version 1.0.6, the same as the current version of the Nintendo 3DS game. In addition to adjusting the character balance, the update adds a prompt to the Notifications menu to take players directly to the Nintendo eShop to purchase downloadable content. The update also adds Share mode to Super Smash Bros. for Wii U, allowing players to post, view, and download replays, photos, Mii Fighters, and custom stages online. The update also adds six additional Ω versions of stages to 8-Player Smash mode. The update also adds compatibility with the first set of released downloadable content. For the game's fourth update, a glitch in interpreting Global Smash Power for Mewtwo was fixed that prevented players from accessing Online, since the data was interpreted as invalid. The fifth game update allows for the game to receive the latest set of downloadable content. The Miiverse stage, along with Dreamland N64 has been added into the game, and individual communities have been created for every character allowing users to post comments to cheer that fighter on. Various other gameplay adjustments have also been made. This update simply makes unspecified gameplay changes. The version 1.1.0 update adds Tournament mode to the game, as well as the ability to post saved replays to YouTube. This also adds compatibility with the latest set of downloadable content released July 31. In addition, upon downloading, players receive the K.K. Slider Outfit and Hat for free. Version 1.1.1 adds compatibility with the latest set of downloadable content released the same day. The update also makes various gameplay changes and it added a wave for the female Robin using the Levin Sword in one of her Victory Poses. For update version 1.1.2, the only update to the game is a fix for a glitch which makes Diddy Kong unable to be grabbed after being hit with a multi-hit attack while shielding. The tenth update of the game adds compatibility with the latest set of downloadable content released the same day. The eleventh update of the game adds compatibility with the latest set of downloadable content released the same day. The twelfth update includes new changes for characters. The thirteenth update includes new changes only for Bayonetta. The fourteenth update adds amiibo compatibility for Bayonetta, Cloud Strife, and Corrin. Due to no balance changes, replays from version 1.1.6 are unaffected. Sixteen downloadable features have been released, consisting of nine stages and seven playable characters. Mewtwo was released in April 2015; owners of both versions that registered the games in Club Nintendo received the DLC for free. Lucas, Roy and Ryu were released in June 2015. Cloud was released in December 2015. Corrin and Bayonetta were released in February 2016. The stages Miiverse, Dream Land (64) and Suzaku Castle were also released in June 2015, while Peach's Castle (64) and Hyrule Castle (64) were released in July, Pirate Ship and Super Mario Maker were released in September, Midgar was released in December 2015, and Umbra Clock Tower was released in February 2016. Finally, six waves of additional Mii Costumes have been released alongside the characters and stages. Bundles also exist which allow players to purchase entire waves or specific portions of the downloadable content. Super Smash Bros. for Wii U natively features amiibo support, and is the first Wii U game to feature amiibo compatibility. Using these figures allows players to have the figure's character appear in the game and fight, either with or against the player or against each other. Every time an amiibo competes in battle, it increases its level and battle stats, the highest level being fifty. Its moves are also customizable. The Super Smash Bros. line of amiibo launched alongside the Wii U game as the first line of amiibo figurines; the Super Smash Bros. line is being released in waves, with every fighter planned to receive an amiibo. 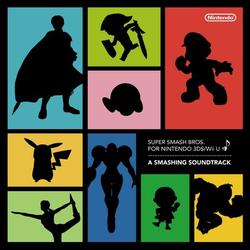 A two-disc soundtrack for Super Smash Bros. for Nintendo 3DS / Wii U was distributed exclusively to Club Nintendo members who registered a copy of both the Wii U and Nintendo 3DS game before January 13, 2015. The red disc contains tracks from the Nintendo 3DS game, while the blue disc contains tracks from the Wii U game. According to Masahiro Sakurai on Famitsu, he was planning on adding the Ice Climbers for Super Smash Bros. for Nintendo 3DS / Wii U, but despite the characters running without problems on the Wii U version, the team had trouble getting the Ice Climbers working in the Nintendo 3DS, as Masahiro Sakurai stated that the fighters in the 3DS version would be running at 60 frames per second. For this subject's image gallery, see Gallery:Super Smash Bros. for Wii U.
GameCube adaptor with special release GameCube controller. ↑ 3.0 3.1 3.2 3.3 3.4 3.5 3.6 3.7 3.8 3.9 Wii U - Super Smash Bros. for Wii U 50-Fact Extravaganza. Posted to YouTube by Nintendo (October 23, 2014). Retrieved October 23, 2014. ↑ Ishaan. (June 14, 2015.) You Can Now Use Your 3DS To Control Super Smash Bros. for Wii U Without A Copy Of The Game. Siliconera. Retrieved June 15, 2015. ↑ Soneek BCM. (Dec 12, 2015). 8 Player Smash on ANY stage YouTube. Retrieved July 15, 2017. ↑ Karmali, Luke (November 25, 2014). Super Smash Bros. is North America's Fastest-Selling Wii U Game. IGN. Retrieved November 26, 2014. ↑ How to Update Super Smash Bros. for Wii U. Nintendo Support page. Retrieved November 28, 2014. ↑ Seedhouse, Alex (January 29, 2015). Super Smash Bros. for Wii U update 1.0.2 now live. Nintendo Insider. Retrieved January 29, 2015. ↑ 14.0 14.1 Nintendo (April 1, 2015). Nintendo Direct 4.1.2015. YouTube. Retrieved April 3, 2015. ↑ McMinn, Kevin (July 2, 2015). Super Smash Bros. Wii U Update 1.0.9 Available. Nintendo News. Retrieved July 2, 2015. This page was last edited on April 16, 2019, at 21:51.